Most wine professionals would agree that no grape variety is more easily identifiable in a blind tasting than Sauvignon Blanc. And perhaps this variety’s unique qualities are more pronounced in wines hailing from New Zealand than in those of any other provenance. As soon as the bottle has been opened and the wine is poured into a glass, an unmistakable perfume fills the surrounding air with notes of zesty citrus, tropical passion fruit, freshly cut grass, tangy gooseberry, and occasionally crisp bell pepper or piquant jalapeño. Often, vegetal aromas like asparagus or artichoke are present as well. But although New Zealand Sauvignon Blanc typically stays true to its varietal character, don’t mistake its consistency for uniformity. Though many of these wines share common aromas, there is a wide range of techniques available to grape growers and winemakers to coax the raw materials into delightfully different final products. The decision of when to harvest the grapes is one way in which producers can influence the style of the wine they intend to make. When Sauvignon Blanc grapes are harvested early in the season, they have high natural acidity and flavors that lean toward lime and asparagus. If weather permits and the grapes are left to ripen longer on the vine, notes of tropical fruit and even peach can develop. Producers will select the date of the harvest with this in mind. Some wineries, for example, Jules Taylor, have several vineyard properties throughout a particular region and will harvest each at a different time, so that they may be blended together for a more complex and layered wine. There are many different clones of Sauvignon Blanc to choose from, and winemakers often select a clone or a mix of clones in order to produce a desired style of wine. Some of these highlight classic New Zealand grassy and herbaceous flavors, while others, such as the Bordeaux clones, tone down these “green” notes and focus on tropical fruit. Mt. Beautiful is an enthusiastic proponent of the latter type of clone. Later, in the winery, yeasts can be selected as well to bring out the desired level of aromatics from the wine. Wineries like Giesen, Whitehaven, Villa Maria, and Nautilus put a high emphasis on yeast selection, while others like Pegasus Bay choose to rely on the indigenous yeast naturally present in the winery and on the grapes. Another option in the vineyard is to encourage lower-yielding vines. Generally, as the number of grapes grown in a certain area decreases, the concentration of flavors in each grape increases. This results in a more complex and flavorful wine, and is becoming a more frequent practice in New Zealand vineyards. Once the grapes have been harvested and transported to the winery, the winemaker has an important decision to make regarding the vessels in which the wines will be fermented and aged. Stainless steel has typically been the popular choice in New Zealand, which preserves the pure, fresh fruit aromas of the Sauvignon Blanc grape. Babich, Mud House, Stoneleigh and Astrolabe are known for making wines in this clean, crisp style. But increasingly, winemakers are turning to various types of oak barrels to produce an alternative style of wine. Unlike the production of, say, some California Chardonnay, the aim here is not to add woody flavors to the wine, but rather to round out the texture and create a richer mouthfeel. Often, as is the case with Brancott‘s higher end “B” Sauvignon Blanc, only a small percentage of the wine spends time in oak to create a subtle effect. Some of these wines, such as those from Staete Landt, have a surprising ability to age beautifully. Another increasingly popular way to enhance the body of these wines is extended lees contact and occasionally lees stirring. This interaction with dead yeast cells adds a creamy yet elegant roundness to the wine. Clos Henri, Mt. Beautiful, Yealands, and Wither Hills all employ this practice to varying extents. Some New Zealand Sauvignon Blanc, such as Loveblock, goes through the process of malolactic fermentation, much more typically associated with Chardonnay. This helps to soften the tart, green, acidic flavors for a more approachable style that could perhaps serve as a gateway for those not used to the more pungent characteristics common to the variety. Yet another way to diversify Sauvignon Blanc is to combine it with something other than Sauvignon Blanc. Pegasus Bay does this beautifully with a Bordeaux-inspired blend of Sauvignon Blanc and Semillon. This adds great complexity, texture, and some subtle savory notes, as well as extra ageing potential. With all of these different methods of producing New Zealand Sauvignon Blanc, not to mention regional variation (Amisfield, for example, is located in the much cooler climate area of Central Otago, the southernmost wine region in the world), it is easy to see that this small country has something to offer that will please just about any palate. If you’ve written off this grape as a one-trick pony, you may want to give it another try. And if you’re already a fan, there likely are many delicious new styles that you have yet to taste. There has never been a more exciting time to drink these wines, which are still almost criminally affordable even for the very best. 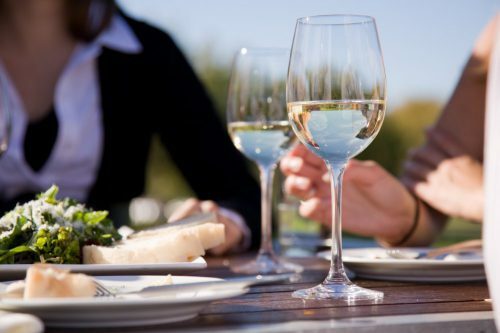 Try New Zealand Sauvignon Blanc well-chilled as the summer heats up, paired with salads, fish, vegetables, goat cheese, or just a few good friends and the warmth of the sun.